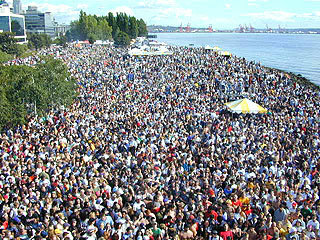 Hempfest always is a huge, happy hunk of humanity. ​With no confirmed venue and no confirmed dates, Seattle Hempfest, the world’s largest annual cannabis protestival, is fighting for its life. Hempfest has filed a lawsuit in U.S. District Court against the City of Seattle in an effort to get a 2011 permit to produce the annual free speech rally, which aims to reform America’s cannabis prohibition. The suit, which also includes Seattle’s mayor, director of the Seattle Department of Transportation, director of Seattle Center, and chairperson of the Seattle Special Events Committee, asks the city to issue an appropriate permit for Seattle Hempfest in August 2011. The lawsuit also seeks, if necessary, to stop Seattle from implementing the West Thomas Overpass project in such a way as to interfere with the use of Hempfest’s home, Myrtle Edwards Park, in August 2011. Planned summer construction of the skybridge in Myrtle Edwards Park, which has been the location of Hempfest since 1995, has displaced the mammoth event which routinely draws more than 100,000 attendees annually.